6.47 points at 17 votes (rank 520). Iridis Alpha is a horizontal shooter with a split screen from the feather of the notorious YAK, also known under his civil name Jeff Minter. 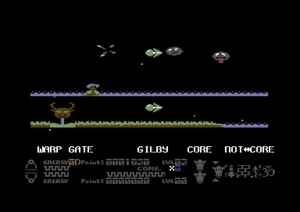 The player controls a droid named Gilby, which can move both flying and by foot over the planet surface. Its task is to visit all sections (level) of the planet Iridis Alpha and silence any resistance with the photon permanent fire. "Hard and fast zapping!" All right? For a shooter IA has a heap of confusingly seeming game mechanisms. It is no usual shooter in the sense that you have to fly through a given sequence of levels as e.g. in Katakis or IO. In fact from a certain point on, the player can jump between the attack waves as he likes. 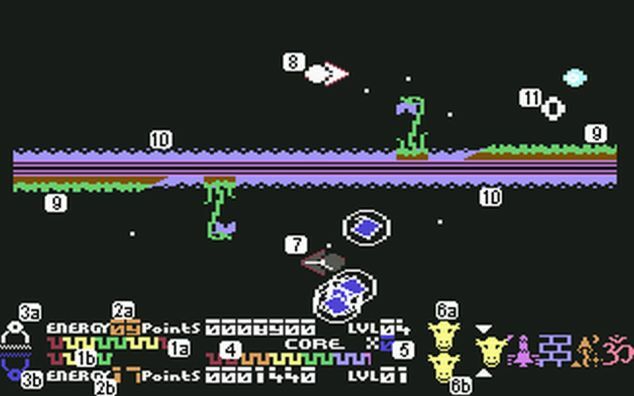 Furthermore, of course there is the second screen, which is activated after the third attack wave and enables the player to do the level jumping on two independently proceeding battlefields. But as already said: just picking up the joystick and start shooting is not possible here, or else your will die fast on the screen and hear a derisive comment from the programmer. Thereby it does not really help that the status display of the game is a textbook example for bad screen layout. The basic principle of the game is that our Android Gilby gains energy for each shot enemy and loses energy for each collision with an enemy. Both too much and too little energy cause the loss of a life. Gilby’s energy status is displayed by a colour: from white for dangerously much energy to black for almost dead. To get extra lives, Gilby can give surplus energy to the planet by landing on the mainland (and only there!). As soon as a certain amount has been given to the planet, a bonus sequence starts at whose end there are an extra life and additional points for grabs. A typical screenshot from the game seems at first confusing. 1a/1b: current energy level of the upper/lower Gilby. It is also displayed be the colouring of the sprite (bright=much, dark= little energy). 2a/2b: Number of enemies left in the corresponding attack wave displayed in hexadecimal code. 3a/3b: Entropy level of the upper or lower Gilby. Read details below. 4: Energy level of the planet. Bonus sequence starts, when it is filled up completely. 5: Points multiplicator. The faster you fly, the more points you get for each shot enemy. 6a/6b: Current played level of the corresponding Gilby. Each level consists of a number of attack waves, which need to be overcome. If enough attack waves have been played through you can change to a different level by flying through the Warpgate. 9: Mainland (core): Here Gilby can land (let go fire button) and give energy to the planet. 10: Water (not core): Gilby cannot land here. 11: These rings are left behind by shot enemies and stay there for a few seconds. If you touch them, you can change between the upper and lower battlefield. If it flickers so relaxingly, this means: Entropy alarm! During the first three attacks of the game you only control the upper Gilby. After that it is possible to switch, if you touch the rings that the shot enemies leave behind. This also MUST be done as the other Gilby now starts to crumble slowly by "Entropy". "Entropy" has nothing to do with the corresponding energy levels, but rises constantly the longer you neglect the other Gilby, i.e. if you do not change often enough. If the Entropy reaches a critical level you are called to attention by a fierce thunderstorm that a change is needed. You then have approx. 3 seconds time to either fly through a ring of a shot enemy or through a warpgate. If you do not make it, you lose a life. Every time enough energy has been gathered by landing on the planet’s surface the bonus sequence starts. For a change nobody shoots here, but you need to cross an obstacle course. Gilby moves by using its canon as drive and thus moves into the opposite direction. Black blocks, one-way symbols, elastic underground and bumpers see to it that the undertaking proceeds especially hectically. Additionally, you are followed by a hive of eyes (? ), which you need to avoid. Driving direction is upward and a successful run through the home straight is rewarded with bonus points and an extra life. But if Gilby is rammed too often by the eyes the race is aborted. If you have mastered enough attack waves to be able to change to another level, the progress screen appears. 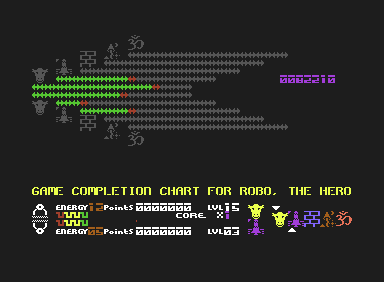 Here, it is shown which levels can from now on be reached by accessing a warpgate. The symbols displayed in white show the activated levels. The green areas show, how many attack waves of each level have already been overcome. If a new level has been activated, you can from now on set the destination of the warpgates by shooting enemies. With each hit on the enemy a pointer moves over the images of the levels at the lower right of the screen. If the pointer is over the desired level, cease the fire and fly through a warpgate. This way you can at first go around dangerous attack waves, to collect some bonus lives in another level first and then return later. As it is usual in almost all games by psychedelic chief guru Minter, also here a landslide of heavily tripped out graphic and sound effects is released on the player. Rainbow-coloured gradients and strobe effects can be found everywhere and mix with the bizarre-abstract sprites that are thrown towards one with the speed of light. As the happening takes place on two screens, the objects seem a bit compact and simple, which of course is hardly noticed in this whole muddle of colours and shapes. Next to the "fractal music" you are showered with a cacophony of shooting noises, echo effects, distorted explosions and some sounds which by no stretch of imagination can be described. The scrolling is smooth and close to the limit of bearable concerning the speed. All in all you are sort of “clocked“ optically-acoustically here – including stimulus satiation and absence attack. There are two pause modes, if you cannot withstand the permanent load on eyes and ears any more: MIF and the DNA double helix. MIF is reached by pressing F1 out of the main game and you leave it again with this key. DNA is started from MIF and exited again with * . MIF (stands for Made In France) is a lovely simple game, in which a rainbow-coloured light beam has to be focussed on a glowing point with the help of mirrors. The mirrors are placed with N and M and make the light beam bend left or right. A shrinking bar in the colours of the Tricolore at the lower...no...the right rim of the screen shows the rest of the time before the game starts anew. Minter had the idea for the game during a ski holiday with programmer colleague Antony Crowther. DNA is a small shenanigans in which you can set the amplitudes and colours of two DNA chains made of EYES (again!) clasping each other and then let yourself lull by the lascivious wave motions. If you want, you can also go for a smoke or take a short walk or mow the lawn, the possibilities are manifold! Keep the fire button pressed! Always keep an eye on the energy level and the Entropy and land in due time or change the side, before you burst. Some enemies take away incredibly much energy with one hit, and others let yourself burst of energy as soon as you have shot more than one of them. Especially mean are the "Lickerships" (??? ), which - starting from the fourth attack wave – at first appear as an angular pair of eyes, but after a hit jump greedily at Gilby, hold him and "lick away" (???) his energy. Here it is important to constantly stay on the move and to not shoot too much, if you do not want to call up several of these pests. As soon as a Lickership has more than one second no contact with Gilby, it will dissolve. In later attack waves the Lickerships appear in disguise as other aliens, or other aliens disguise as Lickerships...and...errh...everything is very, very confusing! Och, go and play Space Invaders! Robotron2084: "Hustle and bustle! With Iridis Alpha there is not a dry joystick in the house. 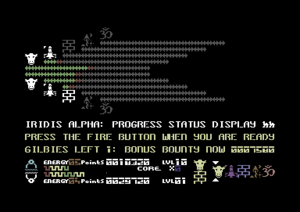 It is one of the most laborious and complicated shooters there is and depicts Minters ′Magnum Opus′ on the C64. There is really EVERYTHING here, and this is quickly too much. Nonstop lightning storms and weird psycho sounds are not really everyone’s cup of tea. The difficulty grade is infernal and calls constantly for uttermost concentration. Unfortunately, the bonus sequences do not deviate from this permanent stress with their unnerving unpredictability. Certainly, some take a distance fast from this ′overambitioned concoction′. Surely a game that needs training, training and even more training and then even more training and requires a certain happiness with psychedelic graphics and an immunity for migraine attacks . Mazy, crazy, screechingly coloured and wonderfully loud, that is Iridis Alpha. Here the synapses are officially shreddered, cooooool! 9 of 10 points." TheRyk: "Overambitioned is really spot-on. Surely the game is unmistakably a master piece – by a very legendary, but also very cranky programmer. But mere mortal non-fans truly have to practice for a very, very long time to take pleasure in it. There is too much happening here in my opinion, to be able to look through. Even without the weird number with the split screen it would be confusing enough. The minteresque psychedelic tootling and flickering does also not really motivate, to try to familiarize with the confusing chaos, even though the graphics are nice to look at (if it stands still and does not flash around). For my taste Iridis Alpha is just about middle, 5 points." FXXS: "Concerning this game I want to cite Frank Zander's "Disco Planet": Unruhe! - Panik! - Wahnsinn! - Jahaha. But I think I rather prefer to make myself off before I get totally screwy and wozzy from the sound, graphics and game logic. I would have wished for more copyists concerning the highscore list with level overview though. 7 points from the view of an average player." 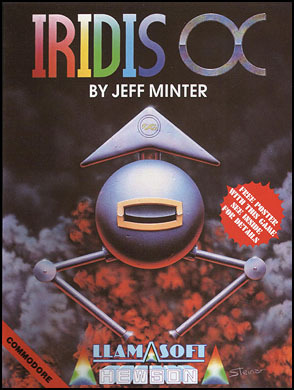 Iridis Alpha is a complex continuation of Minter’s older game "Sheep in Space" in which many main features of IA, as e.g. to budget with energy, were already contained. But in comparison to IA, Sheep in Space stinks really. Many cracked versions of IA are faulty and crash during the fourth bonus round without warning "back to desktop". Hence, the "+6DH 101%" Version by Hokuto Force from 2017 is recommendable, as it contains a bugfix, an NTSC-fix, any trainers you could wish for plus a highscore saver. This page was last modified on 19 August 2017, at 01:16.